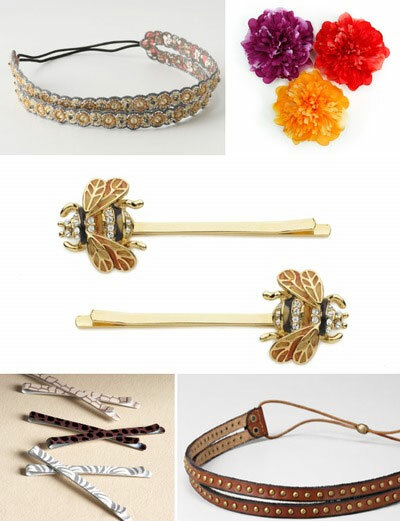 Headbands, clips and pins are chic extras that pull your style together. They can also be intimidating, especially if you haven’t worn hair accessories since you were a kid. Fortunately, there are plenty of grown-up options for adding a bit of whimsy or edge to your tresses. Here are five stylish options that are perfect for summer and beyond. If your last memory of a headband is a wide piece of plastic that makes that spot behind your ears ache, you’re going to be pleased with the new crop of soft, elastic headbands with loads of style. Look for one or two thin straps covered in metallic embellishments, including beads, small jewels and stones, even tiny sequins. Think of this Going In Circles headband, $32 at Anthropologie, as a great piece of jewelry that also holds back your hair. Skip dangly earrings and large necklaces; you don’t want anything to compete with this pretty statement piece. Headbands adorned with clusters of flowers are everywhere, but you’re not the only person wondering how to wear one without looking ridiculous. Instead, stick to a single flower and wear it low for a look that’s effortlessly chic. La Cabana floral clips by Goody, $6.29 at Target, will turn heads in the right way. Leave your hair down and clip a bloom behind your ear, or nestle one into the side of a low bun. It’s the ideal finishing touch for that breezy dress you have in mind for vacation or an outdoor wedding. Adding sparkle to your ‘do is tricky. If you’re not careful, you’ll end up with prom hair. You can’t go wrong with a bit of vintage-inspired twinkle, however, like this Queen Bee bobby pin set, $55 at Kate Spade. Group small, sparkly baubles together for a sophisticated, brooch-like look, and pin them into the side of a bun for a shot of glamour. Ditch your basic bobby pins for this animal print set, $10.50 at the Limited. These darlings are meant to be shown off, so rather than hide them in a messy bun, use the pins to sweep your bangs to the side. Or, gather a few inches of hair from the center of your forehead, pull the section back and pin to keep the style in place. If you love what a studded belt, bag or shoes do for your wardrobe, then you must try a studded headband. Look for small, round studs to create a polished vibe, or try pyramid studs for a rocker feel. This leather version with elastic, $34 at Fossil, adds edge to your look without going overboard. Double leather straps in a cognac hue give it a rich, rustic style that will last through fall. Learn how to make your own trendy chain headbands with this tutorial.